This desk is great! It fit perfectly in my small apartment and was very stylish for a great price. If you are looking for a simple desk with minimal storage, this is the desk for you! Elevate your work area with this elegant writing desk. Available in a range of attractive finishes, the desk features clean lines, crossing X legs, and decorative corner hardware for a sophisticated addition to any decor. Two drawers provide convenient storage space. 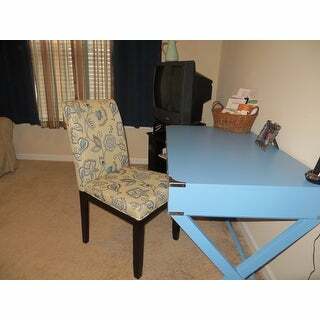 Great desk for small bedroom used as a office. I put this desk together myself & am overweight which gets in the way of doing some stuff. So it was easy for me to put together. The drawers are already installed in the desk top. Just have to put legs together & screw onto desk. Very happy with purchase. Small problems, but overall a good purchase. I bought this Kenton X wood accent writing desk for a guest room. The desk was delivered in good condition, but the support post that stabilizes the legs was missing. Overstock customer service couldn't have been nicer and started the process of contacting the manufacturer for me, sent me follow up emails, and seems to be doing all they can. But it was right before Christmas and guests were on their way. So my husband used a decorative wooden curtain rod that was painted gold as a substitute- he just cut it to fit the space between the X shaped legs and secured it with the included hardware. It actually looks great, my guests had a place for their things, and the piece looks unique. 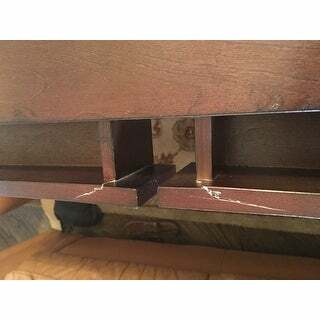 The real issue with the desk is the drawers are not on glides, so they are very hard to open and close. I am not using it as a desk as much as an accent table so it doesn't make a difference to me. I would purchase this again- but not as a desk. THE KENTON X BASE WOOD ACCENT WRITING DESK IS VERY NICE. The color matched with MID-CENTURY LIVING Marin Danish Modern 1-drawer Storage Accent Side Table's midnight blue. They look great together in my daughter's room. Great idea...not so great execution. In all fairness I planned on using this as a computer desk. I think as an pure accent piece or sparing writing table this is a great item. The reason I gave it 3 stars is because it scratches very easy as was the case when I received the item and it is not the most sturdiest of desks. Again I put my 27" IMAC computer on this and it looks great together but it wobbles a little. The look and style is great but it is not as strong as it should be. the Kenton X base wood desk arrived on day late but still in time to complete my office before guests arrived. My husband was able to assemble within 45 minutes (or Less) with proper tools and a little added wood glue at cross support underneath. 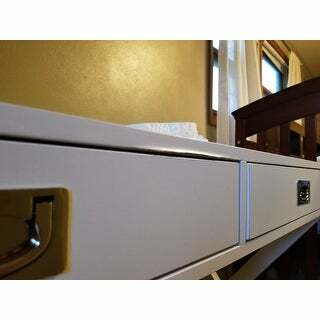 the drawers are not great quality but for the use it will get, it will be fine. the wood was split in the same area of both drawers but I did not notice until recently. It looks nice and will serve its function. I truly was not expecting over the top quality on the desk after reading the reviews. I think I got what I paid for but with minor flaws. The Kenton X Base Wood accent Campaign Writing Desk looks good in our guest room. The color is more green than marine. Also, be careful as the paint scratches easily and the drawers can be a challenge to open and close. Great desk for the price. I ordered two of these desks for my kids in the light blue color. When I received them I was happy to see that the blue wasn't as much of a baby blue as it appears in the picture - it's a bit darker with just a tad of gray in the blue to help make it a bit more mature looking. Ours had no scratches on them at all and were very easy to put together (maybe 5 minutes each.) I think for the money you would be hard pressed to find a cooler desk - colorful and fun - perfect for my tweens. The only slight downside to these desks is that the drawers aren't as deep as the desk is and they are not super easy to glide in and out so putting heavy/bulky things in the drawer would not be a good fit, but that's me being nit-picky. Super happy with this desk. The Kenton line of furniture is sleek, modern and high quality. The writing desk is easy to put together and looks great. I love this desk! The color blue is exactly what I hoped for. It is sturdy and an attractive accent piece as well. I have only good things to say about this desk! I purchased this desk to stand as a desk/bedside table in our master bedroom. It was super easy to put together, 15 minutes max and no additional tools required. The top is heavy and gives the feeling of quality. The table is slightly wobbly when I push on it,however, that might be my own fault in putting it together. We'll see. Overall, it seems to be a great addition to our bedroom. 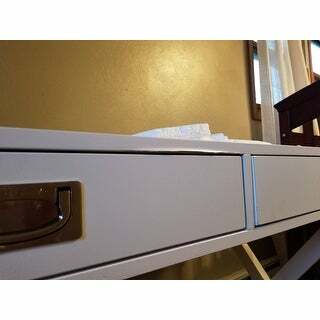 Easy to put together, the only issue the drawers are very small and do not open completely. I bought two of these desks, and will likely buy one more, for our children's rooms. This desk should see them through their school years with plenty of room for a computer and school work, as well as a text book, but it is not overwhelming in size. The drawers are too small to fit a regular laptop (a small, flat one would likely fit fine) into, but will fit a tablet or any of those odds and ends we all accumulate. 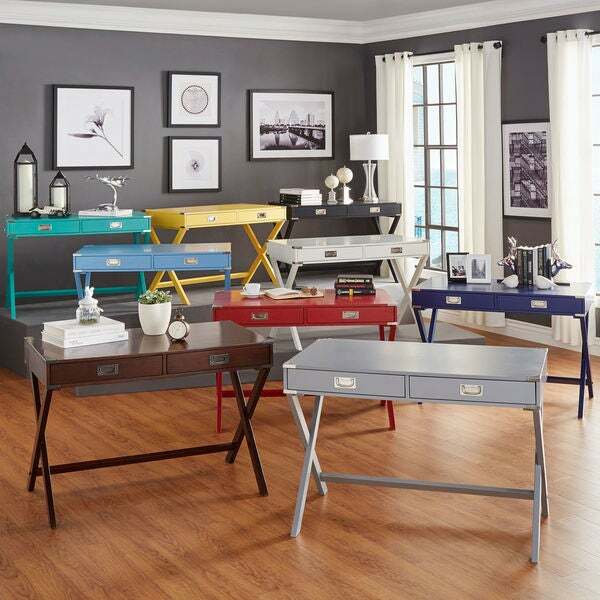 I have found desks like these for almost twice the price in stores, and not nearly as cute. ...but not for daily use. Easy assembly but not very stable - wobbles. Drawers only open halfway so won't hold much. I wouldn't recommend for high usage, but just fine as occasional table/desk in a guest room, or entryway. I finally was able to put my desk together yesterday night. It took me 15 mins to put together. Very easy to assemble. Love the color and the look of the desk. I do have one problem. After putting my desk together, I noticed some paint chipping off by the drawer. The wood look like it's warping. I'm not too sure how this will affect the longevity of the desk. This desk is absolutely lovely and was shipped very quickly. I purchased the espresso finish. The assembly was a breeze. 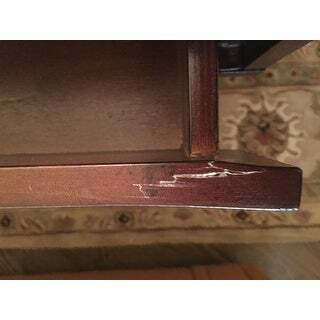 At the very last step when I had to remove the packaging from the drawers I noticed that both drawers were damaged. I rated this product only 3 stars due to the damage. At this point since I assembled the product and it's for my 8 year old son's room, I plan to keep the desk, fixing the drawers myself with some wood glue and finish. I told my son his desk has "character" and we're making the best of the situation. Nice looking desk. It was very easy to put together as the entire desk top, including drawers, were pre-assembled. Drawers slide smoothly. I am very satisfied with this desk. Sturdy, heavy nice desk! I bought this for my son and I’m delighted with the size and quality. It was very easy to put together. I would definitely buy again! Looks awesome in my office get many compliments on it! Good value and a decent desk for kids rooms. It’s lightweight which is why I’m giving a four star rating. But despite being lightweight it’s pretty sturdy. Great desk. easy to assemble. my wife uses it for a writing desk. drawers are not deep but hold address book, stamps and such. love the pop of color it adds to our living room. There was a massive paint-scratch on the surface of the desk. Brand new and with such a major defect. Nice looking desk. Very light weight so not too sure how much quality you are getting. Easy assembly. Nice smooth drawers. Overall, satisfied. Love it! Looks so classy!!! "How much does this desk weigh? It is the Kenton X Base Wood Accent Campaign Writing Desk." This is approximately 56 pounds. "how long is the desk and how tall?" 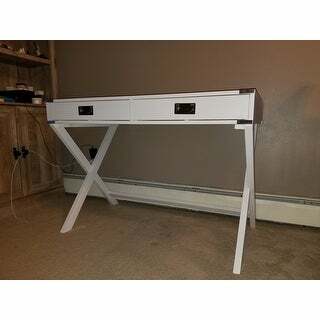 This desk measures approximately 30 inches high x 42 inches wide x 23.75 inches deep. "Is grey color going to come back in stock?" That option is expected to be back in stock in late July. "Is there a power outlet on the back?" This item does not have a power outlet. "Is the back of the desk finished so that it can be placed perpendicular to a wall?" Yes, this item is finished on all sides. "Is the area below the drawers open (you can see the bottom of the drawers) or are the drawers fully enclosed? I need to be able to install a small, slideout keyboard tray beneath the drawers." The area below the drawers is open, not fully enclosed. "Is white going to come back in stock?" Yes, the white desk is expected to be restocked in mid-March.